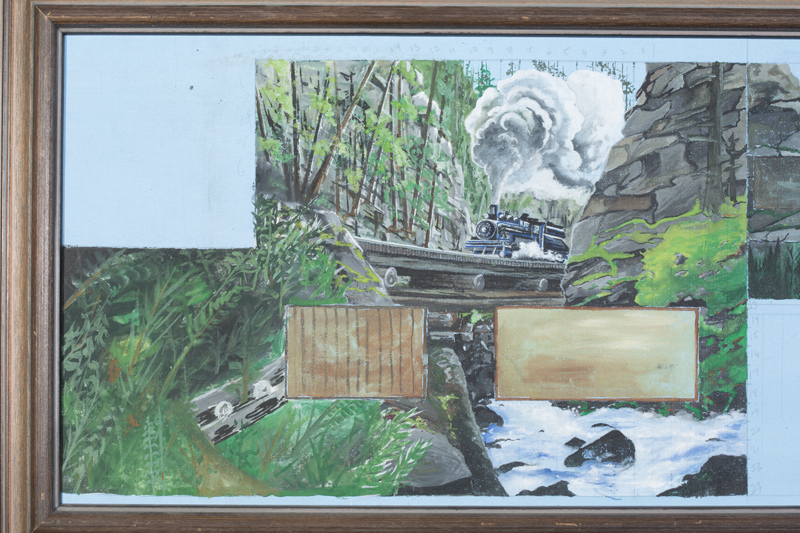 The mural Steam Train On Bridge Over Chemainus River has crossed town. 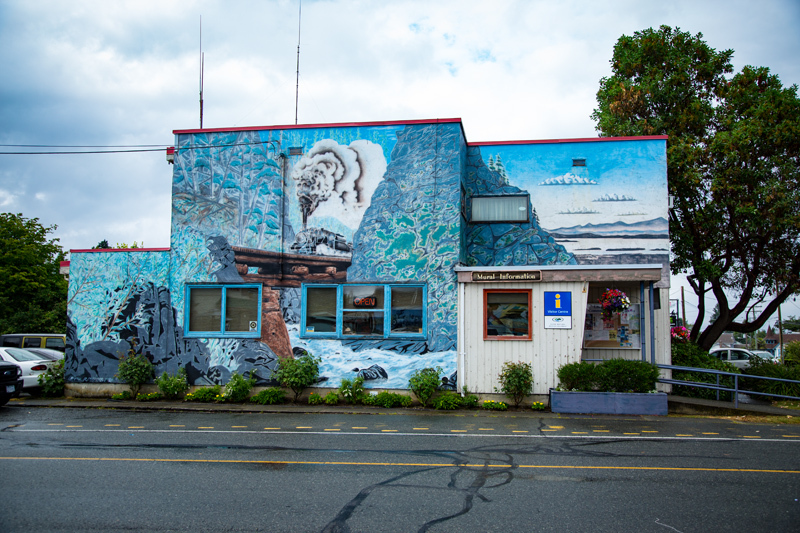 Originally created for the side of the Chemainus Visitors Centre in 1982, the well-loved mural disappeared from view when the building was completely demolished by February of 2016 to make room for a new library. In limbo since then, Mural #3 in the Chemainus Festival of Mural Society’s Historical Series has a new home on the Telus Building on Willow Street. 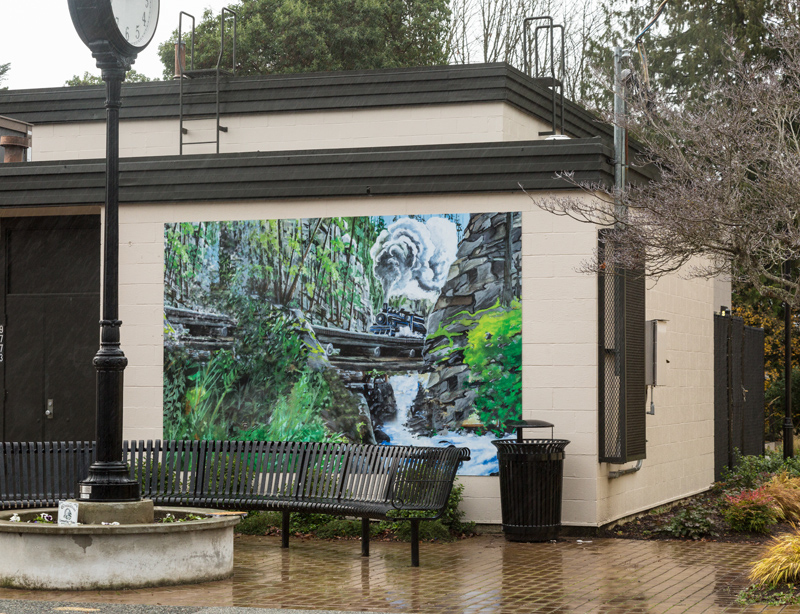 With the help of a grant from Telus, the mural has been recreated using technology new to Chemainus. The artwork was difficult to reproduce photographically because of the windows and various other obstructions on the wall of its old home. To work around this, a digital image was created from the artist’s original concept drawing that now hangs in the Chemainus Valley Museum. The finished file was printed on a special plastic film and mounted on three aluminum panels. Leon’s Signs created the film and installed it on November 24. To fit its new site, the finished mural is smaller than the original, which spanned the full 16.3 metre by 6.6 metre (53×22 feet) length of the visitors centre. The same technique will be used to recreate Mural #5, Fallers Undercutting A Fir, that was painted on the back of the Chemainus Fire Hall, demolished at the same time. This reproduction will be placed on the side of the new fire hall in Old Town, across the street from Riot Brewing. Neither mural could be salvaged from their original homes as they were painted on cement blocks containing asbestos. Recently installed recreated Steam Train mural. Original “Steam Train” mural on the now demolished Fire Hall building. Artist’s concept was used to recreate new mural using digital technology.